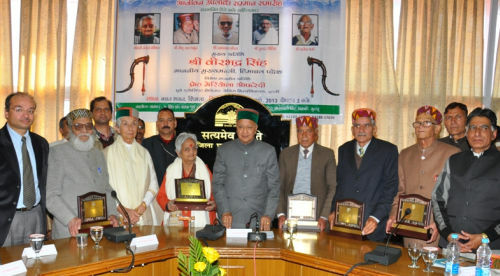 Chief Minister Virbhadra Singh conferred the “Lifetime Achievement Awards” to five Veteran Litterateurs at a prestigious function held at Bachat Bhawan organized by ‘Himalaya Sahitya and Sanskriti Manch Himachal Pradesh’ here today. The Lifetime Achievement Awards were presented to Satyen Sharma, Dr. Molu Ram Thakur, Sunder Lohia, Ram Dayal Neeraj and Saroj Vashisth for their outstanding and long lasting creative contribution to literature. Speaking on the occasion, Chief Minister Virbhadra Singh announced that the State Government would re-open all the ‘Writers Home’ which were closed during the regime of previous BJP Government. Chief Minister said that Congress Government had set up Writers Home in all Districts but previous Government overlooked this scheme and all the writers home were closed one by one. He said that Sanskriti Sadan at Dharamshala was set up at a cost of Rs. 60 lakhs which had now been given to Central University for its camp office. Adding that the government has decided to hand over this building for writers after the construction of university building was complete. Virbhadra Singh said that the Government would provide free traveling facility to the State Awardees and Academy Awardees in Himachal Road Transport Corporation buses besides purchasing books worth Rs. 20,000 written by Himachali writers. He said that these announcements were made by him during the Academy Award Ceremony held at Hotel Holiday Home in 2007. Chief Minister said that previous Government was insensitive towards writers who were contributing a lot in the field of literature and had not presented any Academy and State awards to them during last five years. He said that previous BJP Government during its tenure manipulated several awards from agencies. The Government would fix the accountability of officers who failed to present State Awards and Academy Awards instituted by Language and Culture Department, he added. Virbhadra Singh congratulated the Lifetime Achievement Award winners and said that the State Government was committed to preserve and promote art and culture of the state and would also seek the cooperation of writers, artists, and cultural artists. He lauded the efforts of Himalaya Sahitya and Sanskriti Manch to honour the veteran writers in reorganization of their literary contribution for the society. S.R. Harnote, Chairman, Himalaya Sahitya and Sanskriti Manch Himachal Pradesh welcomed the Chief Minister and apprised him about the activities of the Manch. He also put forth the various demands of the writers. Rajender Rajan, Editor, Irawati magazine, conducted the proceedings and presented vote of thanks. Meriyola Ofredi, Retd. Associate Professor (Hindi Department) of Venice University, Italy said that India was her second home as she had given more than 50 years to promote the Hindi language in the Italy. She felt elevated to be among the veteran and renowned writers. Manish Garg, Secretary, Art, Language and Culture, Dinesh Malhotra, Deputy Commisioner, Abhishek Dular, Superintendent of Police, Dr. Devender Kumar Gupta, Director, Art, Language and Culture, Om Parkash Balmiki, Shriniwas Shrikant, Tej Ram Sharma, Shriniwas Joshi, Keshav Narayan, writers and other dignitaries were also present on the occasion.